Continuous ion exchange units by Calgon Carbon separate, recover, purify, and synthesize a host of materials, including high-fructose corn sugar from many food and beverage products. Remove color, taste, and odor from cane sugars, corn syrup, dextrose, and fructose. Caffeine removal with minimal loss of flavor and product components. Purification via color and odor removal. 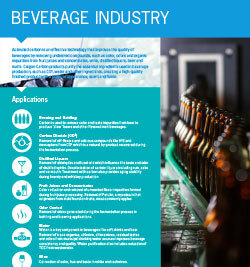 Purification of water, liquids and gases involved in the brewing and bottling process. Decolorize and purify organic acids and amino acids from fermentation processes. Treatment of water having stringent purity and quality requirements. Decolorize and remove impurities from vitamins and acids during the manufacturing process. Used in cigarette filters to remove poor taste in the smoke.